The 2019 Ski-Doo Renegade X-RS 900 ACE Turbo produces a claimed 150 horsepower that comes on hard…maybe too hard for some. L x W x H: 118.7 x 47.9 x 48.1"
The 2019 Ski-Doo Renegade X-RS with the 900 ACE turbo power system may be the company’s first ever turbo hot rod crossover, but it invites direct comparisons to another turbocharged package crossover series, the Yamaha Sidewinder LT-X LE. We will give the two sleds a toss-up vote on handling and chassis packaging, maybe even giving the Renegade turbo an edge in overall sled balance. After all, isn’t that what the new GEN4 chassis strength is supposed to be? Even if the first 850 GEN4 models were designed for the big two-stroke power plant, you knew that there would be a version of the Gen4 Ski-Doo to fit a four-stroke or two and that nifty new 600R Rotax two-stroke. Mark model year 2019 as that season. We like the GEN4 with the 850 and now with the 125-horsepower 600 twin, we like it as well. There’s not a lot of difference in the handling between the two two-strokes other than the obvious power differences helping the 850 dig out of corners faster and getting off the line quicker. It should. It does. And it’s noticeable. Ski-Doo continues to be the leader in styling as it makes this 544-pound crossover cruiser lean with brawny, beefy trail appeal. Side to side cornering agility with the GEN4 exceeds that of all previous REV chassis generations with power delivery that is very manageable for two-strokes, especially the new 600. 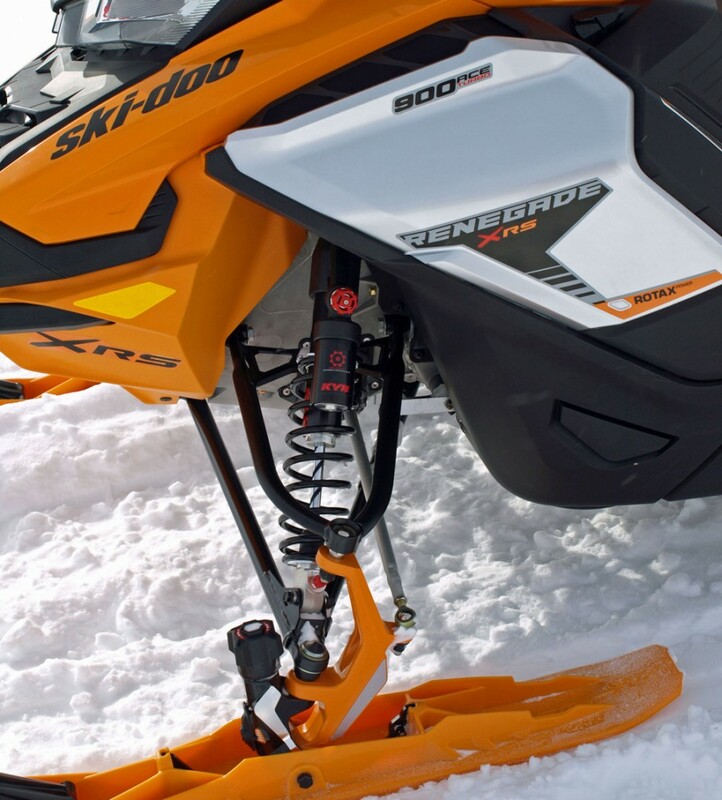 Ski-Doo has done some very nice things with this sled, especially its tweaking to X-RS status. The one you want is the X-RS with full on “adjustment” package that includes the runningboard-mounted rMotion adjusters, the readily accessible clickers on the RAS3 front end’s KYB Pro 36 Easy-Adjust aluminum bodied gas shocks, and the adjustable depth ski runner of the TS ski. 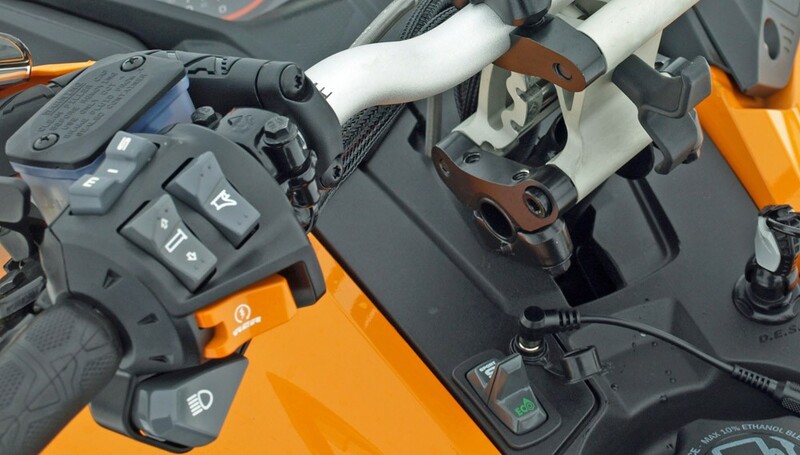 For another US$330 you should consider having your dealer add the optional “remote coupler block” that will quickly change the rear block setting at the twist of a handlebar-mounted remote activator. This lets you go from an uncoupled to coupled suspension in an instant. Meaning that for more ski pressure (cornering control) go coupled or uncoupled for greater weight transfer and ski lift for off the line acceleration or “passing gear” acceleration in the case of the power boost at mid-throttle of the 850 twin and hard-hit boost with the new 900 ACE turbo. The basic GEN4 Renegade X-RS ticks all the thrill boxes for a truly adaptable, sport riding on and occasionally off trail true sport sled. This season you’ll find two versions of the X-RS, unfortunately one of them isn’t a 600R version. In addition to the 850-powered Renegade X-RS is a new version with widened engine bay and taller hood elements to fit a snowmo-version of the 900 ACE turbo seen in the US$20,000 Can-Am Maverick X3 Turbo. In the side-by-side wheeler, Rotax’ 900 turbo pulls up to 172 horsepower with its own Rotax-developed one-piece turbo and exhaust manifold for instant action with nary any turbo lag. 2019 Ski-Doo Renegade X-RS 900 ACE Turbo peaks at a claimed 150 horsepower at 7750 revs with a very low engagement of 2200 RPM. 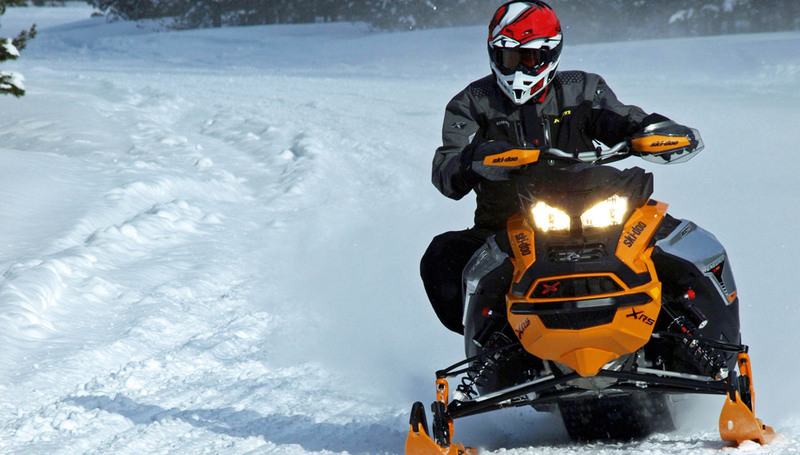 Ski-Doo notes that the greater real estate available on the Can-Am allows more room for better cooling and intercooler placement versus the limited packaging under the hood of a snowmobile. If ordering the X-RS go with the “adjustment package” that gives you the very easy to set “clicker” shocks, runningboard-mounted rMotion adjusters and the TS adjustable blade runner skis. 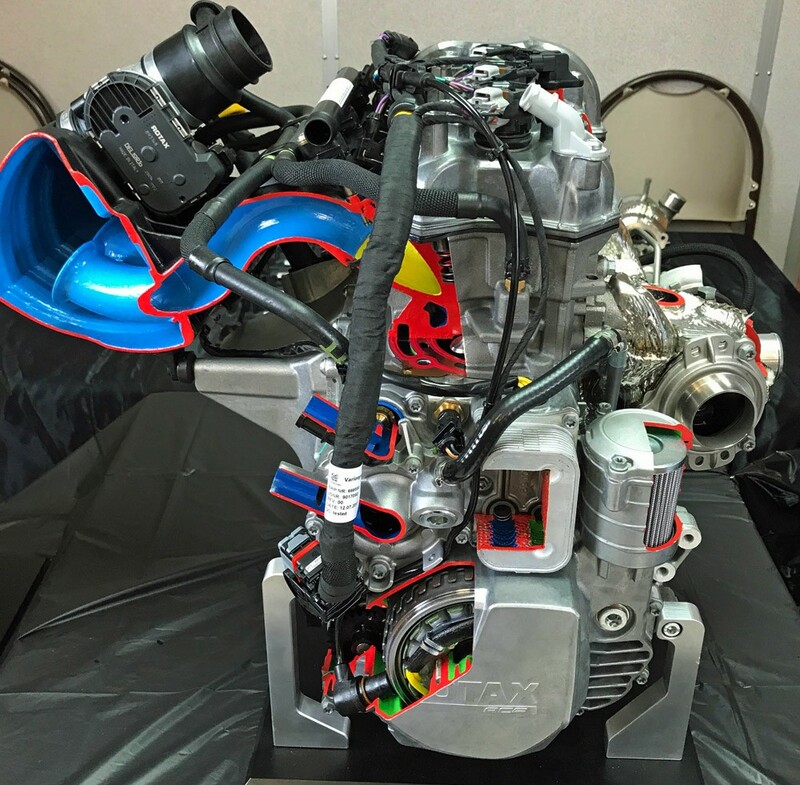 Ski-Doo designers had to finagle this massive looking four-stroke turbo block in a space normally occupied by a two-stroke twin. The end result looks downright handsome as the styling creates a brawny muscled and sculpted countenance. The hood fitting is raised, and voluminous vents added to feed the intercooler, with as much incoming cooling air as possible. 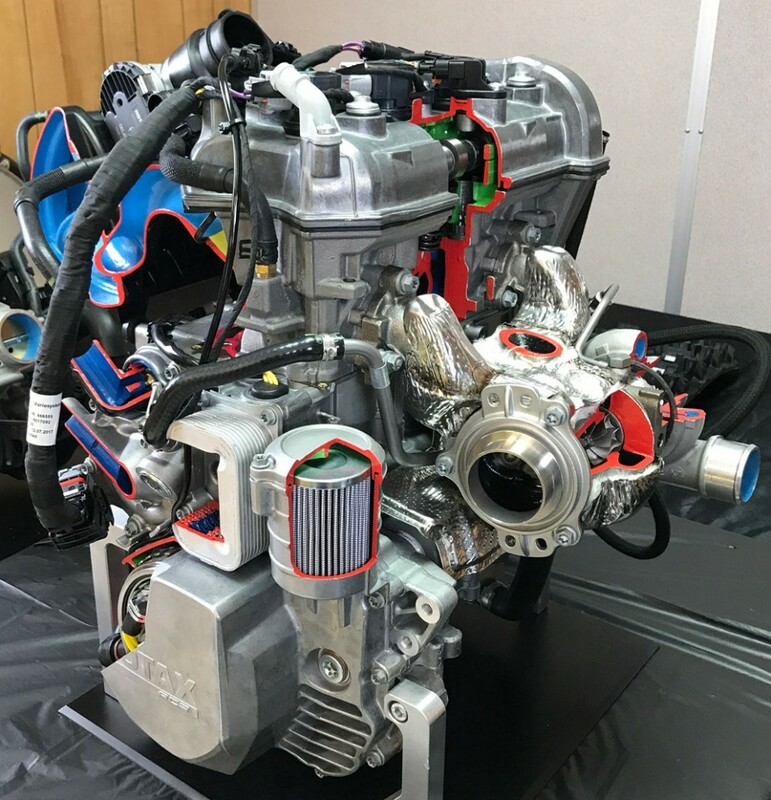 With a boost of up to 12 pounds per square inch and the resulting additional heat generated by an enclosed turbo, we suspect Ski-Doo kept the 900 ACE turbo underpowered versus its Can-Am kin to resolve those potential underhood heat issues. 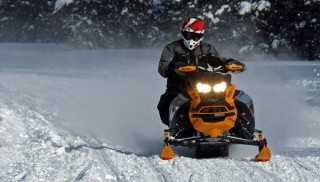 With the “detunement” and the appearance of a four-year coverage option for pre-season purchases for 2019 year models, we figure Ski-Doo is quite comfortable with the reliability and durability of its new 900 ACE Turbo sled power system. 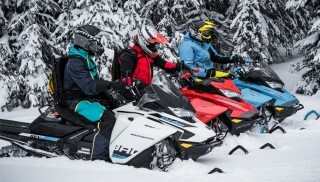 There’s good news for buyers of 2019 non-turbo 900 ACE powered sleds. When making updates to fit its turbo, the base 900 ACE benefits from a new air intake, exhaust and pertinent new calibrations. Meaning? The 2019 version adds five horsepower. The 2019 Ski-Doo Renegade X-RS 900 ACE Turbo adds 55 horsepower to the base 900, which gives it 25 more horsepower than the former top of the line four-stroke 1200 4TEC triple. 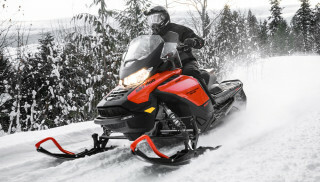 Expect weight over the skis to be greater as the base 900 is about 114 pounds versus the estimated 132 pounds of the 1200 4TEC and more, though not specifically known as this point of the snowmobile 900 turbo. The previous 150-plus horsepower Can-AM 900 ACE turbo fitted to the performance 4-wheeler is listed by Rotax as weighing124.4 kilograms (274 pounds). We can assure you that Ski-Doo did not fit a 274 pound brick in the engine bay of the X-RS. Those numbers represent necessities for cooling, dust and dirt exclusionary system and larger intercooler and such for its off-road terrain buster. So, while we felt the new turbo X-RS was heavier in steering, pushed more in the turns than the 850, and seemed heavier forward of the ski line, it’s no 274 pounds heavier. Ski-Doo lists the 2019 Ski-Doo Renegade X-RS at 544 lbs or 41 pounds greater than the 850 two-stroke version. Rated at 150 horsepower at 7750 RPM with an engagement speed set at a low 2200 revs, the 900 ACE turbo provides a significant power hit right about mid-throttle. It is explosive and can be unsettling if you don’t expect it. When it hits it will lighten the front noticeably. Precisely balanced components ensure minimal vibration to maintain low noise level of the ACE engine. Shielded manifold validated to withstand temperatures of 980 degrees Celsius. Can-Am owners may be familiar with the 900 ACE turbo as it powers Can-Am’s Maverick X3 Turbo, but with an added 20 horsepower. New exhaust valve, more heat resistant material for turbo application. Adding 50 turbocharged and highly caffeinated horses makes certain that the top end power doesn’t drop off the grid. Equipped with Ski-Doo’s multi-mode engine switching of Sport, Normal and ECO settings, we found unexpected and impressive power in ECO, most manageable in the midrange setting and unsettling quirky performance in the Sport range. Add in that “fly by wire” intelligent throttle element and we became frequently uncomfortable modulating the turbo’s drivability over especially rough trail sections. That’s because the thrill factor built into the turbo seems to offer a power explosion right around mid-throttle input. The turbo power hits quick and hard – juicing your ride to a new level. Plus, the nearly non-existent “pull” on the lever can be burped when hitting big bumps. The cockpit of the Renegade Turbo can be a busy place with controls to adjust the handlebar position, three modes of electronic performance from ECO to Sport and the normal left-hand control for pushbutton start, a screen activation mode and warmer settings. Now, here’s where we disagree with Ski-Doo and its concept of power boosting performance. When we first experienced the 850 prototypes, they also reflected a deliberate mid-range power boost. If you ride on the throttle most of the time you overlook it and settle in. Since those early Year One 850s, we’ve sensed that the midrange throttle boost has been pared back and the sled is much, much easier to drive. Our experience with the 900 ACE turbo was much more exasperating as all three of the Turbo-equipped Ski-Doo’s we rode had similar hard hitting, ski lightening performance. We could never settle in, even with the supposedly tame GT Limited Turbo. Ski-Doo’s turbo reminded us of a long ago 145-hp 1995 Arctic Cat 800 ZRT with an uncoupled suspension that kept wanting to take us into the trees when we tried to throttle hard off a turn. Its power came in quick and hard, too – lifting the skis at usually the wrong moment. As we’ve said on many occasions, Ski-Doo understands the value of nuancing its products for fit and finish. 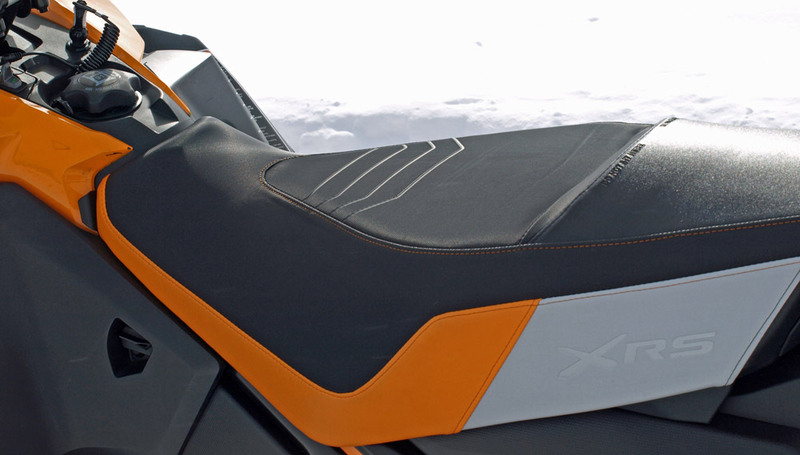 Notice the embossed “XRS” on the new Turbo X-RS saddle. Earlier we mentioned that this new turbo series invited direct comparison to Yamaha’s 200-plus horsepower Sidewinder series. Here we go. 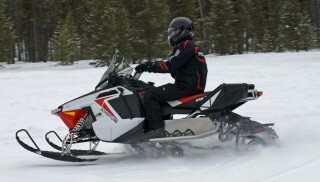 That sled with 50-60 more horses on tap is much more drivable, manageable and rider-friendly. The Yamaha reminds us of the controlled power we got out of our nuanced six-cylinder BMW Z3 or even the rumbling Hemi power of our Ram pickup. The power spread seems more linear and, therefore more tenable than with the 2019 Ski-Doo Renegade X-RS 900 ACE Turbo. Admittedly, the turbocharged Yamaha seems a bit nose heavy as well, but the easier modulation of the power and throttle doesn’t come in with an unexpected power burst. That leads us to believe that Ski-Doo has a focus group of “performance” riders that they bring in to tell them what they want in sled performance. Most of these riders must harken back to the age of super mod two-strokes that were like light switches with power that was either off or on – right now on! We’ll pass. We prefer controlled power and relish the way you can smoothly roll-in the Sidewinder’s turbo (or the 850’s power) as you easily modulate the power driving through a sweeper and powering on to a straight. It’s like hitting the perfect golf shot – so we’re told. 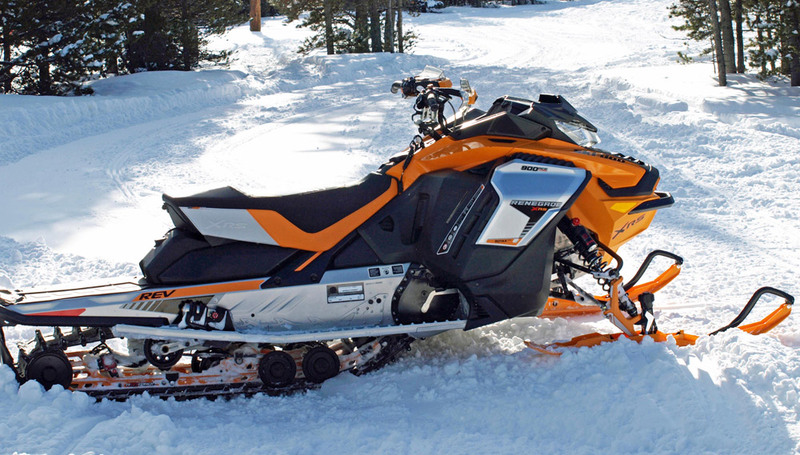 You’ll find the full complement of “premium” features for ride and handling prowess as the Turbo X-RS features KYB Pro 36 R shocks that complement Ski-Doo’s RAS 3 double A-arm front end very well. That’s our view. The 2019 Ski-Doo Renegade X-RS 900 ACE Turbo is definitely trick, gives you a power burst that you’ll definitely feel and the X-RS has all the best bits for a longish tracked sport performer. You’ll have buttons galore to push from the cowl-mounted three power mode rocker, to a left-hand control filled with multi-mode warmer settings and such. As a Ski-Doo fancier, the 2019 Ski-Doo Renegade X-RS 900 Ace Turbo will give you the features and benefits you expect in a top dollar model. Ski-Doo does “tricks” and styling better than any other sled maker. The Turbo Renegade is supremely handsome, but just know there are other turbo options available.